A rescue operation is underway in Ecuador after the South American nation was hit by its worst earthquake in decades, which saw at least 272 people killed and hundreds injured, and left many others trapped under the debris. On Saturday, the 7.8-magnitude quake struck off Ecuador's Pacific coast, 170 kilometers northwest of the country’s capital, Quito, causing death and destruction in Manta, Portoviejo, Pedernales, Guayaquil and other coastal cities and villages. The death toll has risen to 272, with more than 2,500 people injured in the earthquake, according to Ecuadorian Vice-President, Jorge Glas. “There are people trapped in various places and we are starting rescue operations,” Glas said, as cited by Reuters. “It's very important that Ecuadoreans remain calm during this emergency,'' the PM stressed later in Ecuador's national crisis room. Ecuadorian President Rafael Correa, who had to abort his visit to Rome and urgently return to Ecuador, declared a state of emergency in six of the country's provinces. "The immediate priority is to rescue people in the rubble. Everything can be rebuilt, but lives cannot be recovered, and that's what hurts the most," the head of state stressed. Around 10,000 soldiers and 4,600 police officers were assigned to assist the rescue workers and maintain order. Venezuela, Mexico and Chile are sending personnel and supplies to Ecuador as part of the international aid effort. The footage from Manta showed survivors, including children, being taken from the rubble in a joint effort between rescuers and local residents. Emergency shelters and portable hospitals have been set up for those affected by the biggest quake in the country since 1979. More than 3,000 packages of food and around 8,000 sleeping kits were being delivered, the government said. The situation in the town of Pedernales, a tourist spot famous for its beaches, is now “catastrophic,” with looting breaking out amid the chaos, according to mayor Gabriel Alcivar. 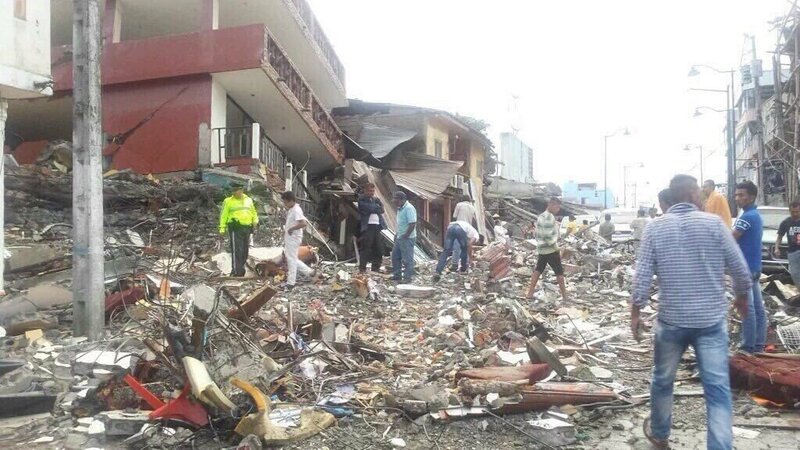 There were 135 aftershocks registered in the Pedernales area after Saturday’s quake, the Ecuadorian authorities said. In Ecuador's largest city, Guayaquil, a bridge collapsed on a car, killing the driver. People spent the night on the streets in fear of aftershocks. Residents in Quito told AP that they were “in panic” as six buildings had collapsed and power was down in several neighborhoods. Towns near the epicenter were evacuated for several hours, as the authorities feared a tsunami might follow the quake. It’s the worst disaster of its kind in Ecuador since the earthquake of 1979, in which 600 people were killed and 20,000 injured. Japan was hit by two deadly earthquakes earlier this week, in which over 40 people died and more than 200 were injured. However, the US Geological Survey said the Japanese and Ecuadorian quakes are unlikely connected, despite both countries being situated on the seismically active ‘Ring of Fire’ in the Pacific.